Winding streets dotted with homes depicting the vintage style of Old-Florida architecture with metal roofs, clapped siding, dormers and cupolas and welcoming front porches. Oak trees, brick paths, and native palms add to the charm of this neighborhood, which reflects on the area’s location near Gulf beaches, silent mangrove, and native bird sanctuaries. The Island features a waterfront lifestyle and many of the residences overlook the boat docks, the lagoon and the Caloosahatchee River. Shady parks and sunny walks give residents a perfect chance to appreciate the ideal location and lush landscaping of Shell Point. The Woodlands at Shell Point provides a wide choice of residences, as well as access to the challenging 18-hole golf course. Secure and private, The Woodlands is surrounded by nature preserves, greenways and lakes, and is ideal for those who enjoy an active outdoor lifestyle. Tucked away between the 14th and 16th fairways of the championship 18-hole Shell Point Golf Club, Eagles Preserve offers a secluded enclave of residences designed for the active retiree. For individuals seeking the ultimate waterfront lifestyle, look no further than the Palm Acres neighborhood. Palm Acres is a quiet, well established neighborhood located adjacent to the entrance to The Island. 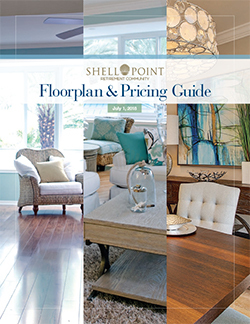 Truly, when it comes to living at Shell Point, variety is the spice of life. 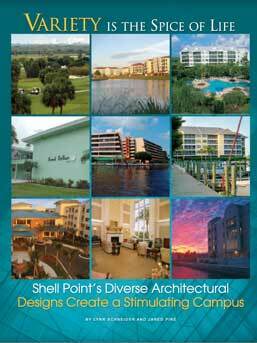 This article explores the unique architectural designs within the Shell Point Community.